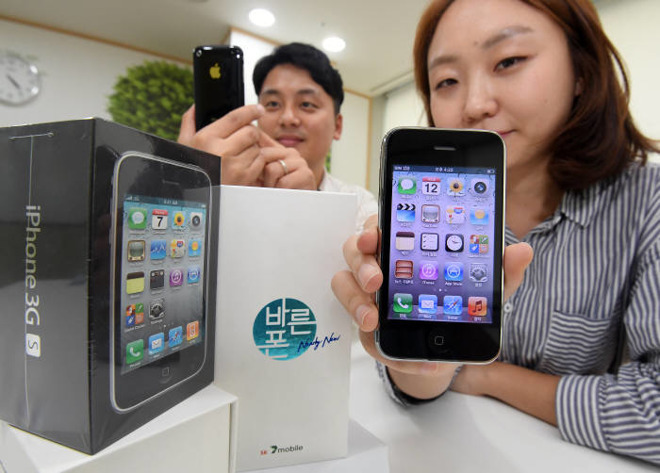 In an unusual move, a South Korean company is planning to resell units of Apple's nine-year-old iPhone 3GS —new and unused in original packaging. Models will go on sale later this month from SK Telink, according to Korea's ETNews. The phones were retrieved from a warehouse in their original packaging, including accessories, and simply tested to ensure the hardware was still intact and functioning. Because the 3GS is unable to run anything later than iOS 6, many modern apps and features are inaccessible. Repairs and accessories may also be difficult to come by, especially since Apple switched from 30-pin connectors to Lightning with 2012's iPhone 5. Basic functions should work though, such as calling, SMS, and music playback. SK Telink is also selling the product contract-free for just 44,000 won, a little over $40, which is far cheaper than most smartphones. An iPhone SE starts at 490,000 won in Korea, about $452. Apple will occasionally keep producing and selling outdated iPhones in some markets, such as India. But, Apple itself has never reached quite so far back in its history like SK Telink has.